While Mini Grey's Traction Man Meets Turbo Dog made my Best Picture Books of 2008 list, this is my first review devoted to her wonderful books. Traction Man and the Beach Odyssey couldn't have come at a better time. 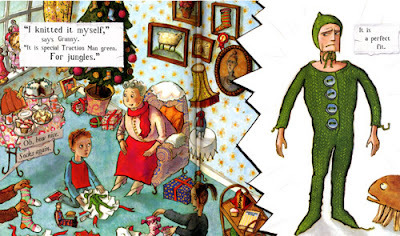 I recently wrote an article on Gender Equality in Picture Books and came to the conclusion that, rather than more books with girl protagonists or more books with boy protagonists, we need books that feature main characters who's gender is irrelevant. OH NO! 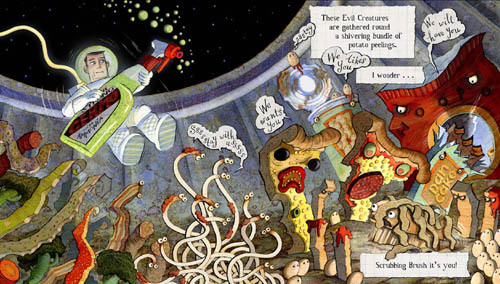 (Or How My Science Project Destroyed the World) by Mac Barnett and Dan Santat is a perfect example this. This picture book shakes up conventions by attracting that supposedly elusive and selective boy listener/reader despite featuring a protagonist who is a girl. A fantastic, well written (and illustrated) story is the key to mass appeal in my opinion. 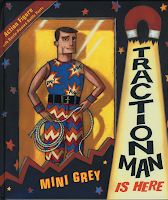 Mini Grey's Traction Man books also shake up conventions by presenting a main character who, while he may be a crime fighting action hero, is really just a doll with cool accessories. 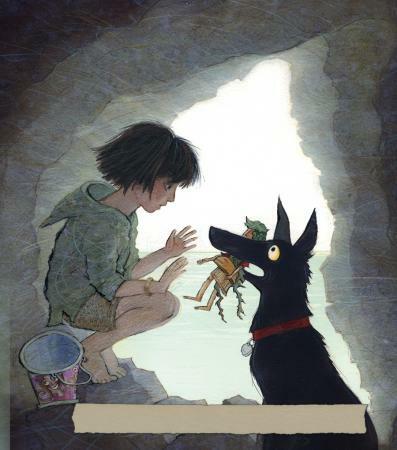 Her books succeed because of the depth of creativity and imagination she brings to her stories and illustrations. 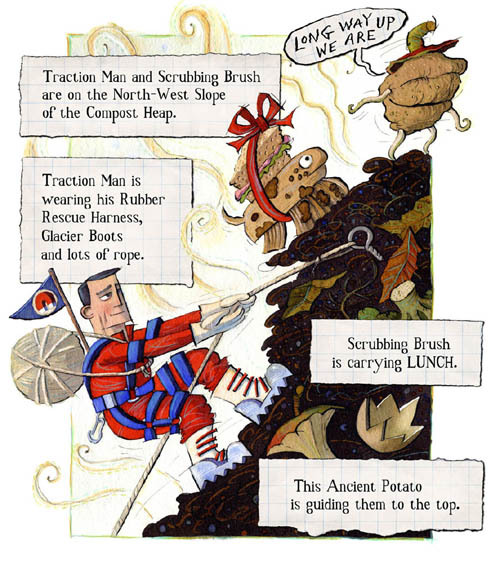 I first discovered Traction Man is Here in 2005 and fell in love with it. The title page features a hand-written letter to Santa asking for the newest Traction Man since old Traction Man met with a "Terrible Parachute Accident." 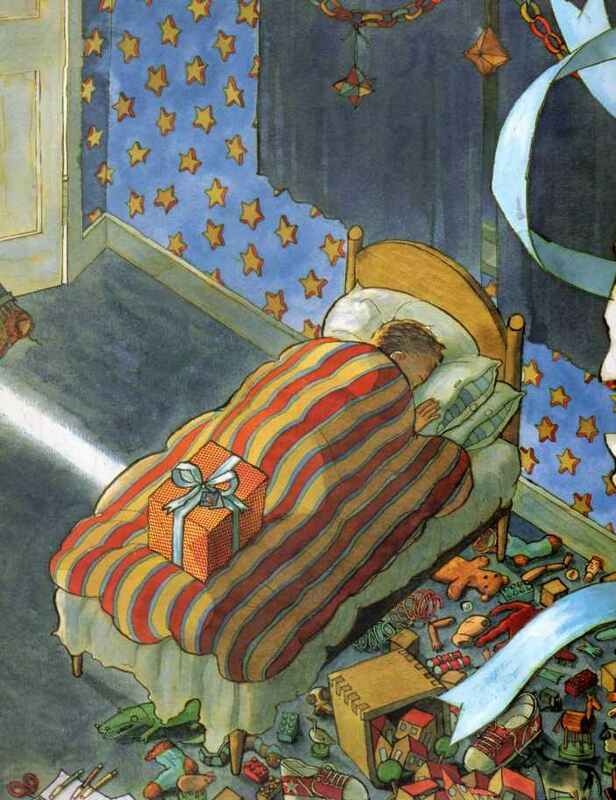 The next page shows a sleeping boy, a present at the foot of the bed and then the unwrapped package that holds Traction Man "wearing Combat Books, Battle Pants, and his Warfare Shirt." From then on, the story is told entirely from Traction Man's perspective. Traction Man's stories are so engrossing that you completely forget that you are being treated to some fantastic flights of imagination on the part of the little boy. Grey thinks up brilliant foes for Traction Man to tussle with, from the Evil Pillows that hold the Farm Animals captive to the Poisonous Dishcloth who makes an appearance when the boy does chores and washes the dishes. 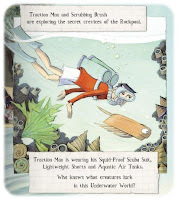 Traction Man, "wearing his Sub-Aqua Suit, Flourescent Flippers, and Infra-Red Mask" (Grey always does a great job of describing the various outfits and accessories that are called for on any given mission) searches for the Lost Wreck of the Sieve and is rescued by the "brave little Scrubbing Brush!" 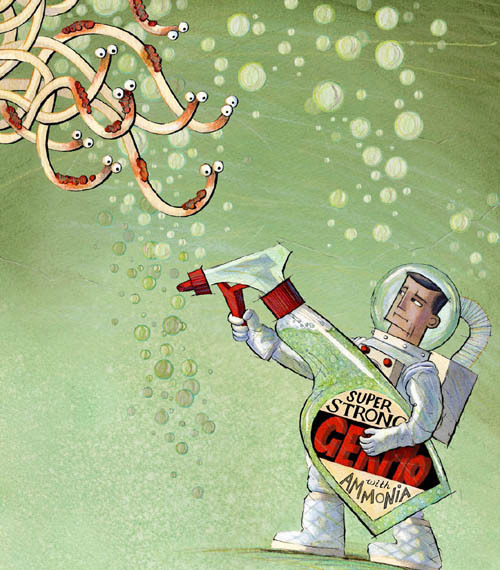 Scrubbing Brush becomes Traction Man's pet and sidekick. Don't miss the photo near the end of this review that shows a real-life Traction Man scenario put together by Grey with a very cool Scrubbing Brush. A visit to Granny's on Christmas Day brings a gift for Traction Man! "Oh! How lovely (grrr). A all-in-one knitted green romper suit and matching bonnet!" How Traction Man and Scrubbing Brush bear the embarrassment of the romper and save the Spoons in Traction Man is Here is hilarious. 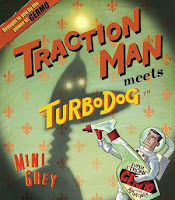 Traction Man Meets Turbo Dog begins with the dynamic duo "on the Northwest Slope of Mt. Compost Heap." Traction Man is wearing his "Rubber Rescue Harness, Glacier Boots and lots of rope." Scrubbing brush is wearing lunch. The duo makes it to the summit after passing through the Mystic Shrooms and they plant their flag. The return home finds them "drying off in front of the heater. Traction man is wearing a spotted hanky." Mom and Dad tuck a present (Turbo Dog) at the feet of their sleeping son while Dad uses a pair of tongs to nab the filthy Scrubbing Brush and toss him in the trash. Grey layers in some great extras in this book, from Dad's "Man About the House" magazines strewn about to Mom in her workshop with a band saw. How Traction Man adjusts to his new sidekick, the not very versatile Turbo Dog, while at the same time searching for his missing pal is a grand adventure that includes daring visits to the Grand Canyon Sofa, a trek across the "wastes of the Sandpit" where they encounter the very shy Handbag Dwellers (somehow, a purse with make-up in it has been half-buried in the sandbox) to the final, epic battle in the "Dark and Terrible Underworld of the Bin!" Traction Man and the Beach Odyssey finds our hero, the boy and his family, including Granny and her "new Young Pet called Truffles," headed out on holiday at the shore. Traction Man is wearing his "Squid-Proof Scuba Suit, Lightweight Shorts and Aquatic Air Tanks. Who knows what creatures lurk in the Underwater World?" I love the way that Grey uses capitals to create a tone of mock-serious superhero-speak in her books. Mollusks threaten Traction Man and Scrubbing Brush, but Truffles is the real danger in this adventure. After being buried in the sand the duo find themselves washed out to sea on a "huge seaweed mass" with a bottle of Germo tangled in it. Again, Grey layers in more and more details (including fantastic endpapers), making the stories richer and even more engaging (and perfect for repeated readings) that before. Traction Man and Scrubbing Brush are rescued but find themselves in for a possibly worse fate when a girl rescues them and carries them back to her spot in the beach in a "Beach-Time Brenda Bucket™." Trapped in the Dollies' Castle, it seems like all is lost until an unlikely rescuer comes along. In a perfect ending, Grey has Traction Man and the Dollies "digging an exploration hole to the Center of the Earth. (The Dollies are wearing Safety Jackets, Excavation Shorts and Cave Helmets borrowed from Traction Man.)" 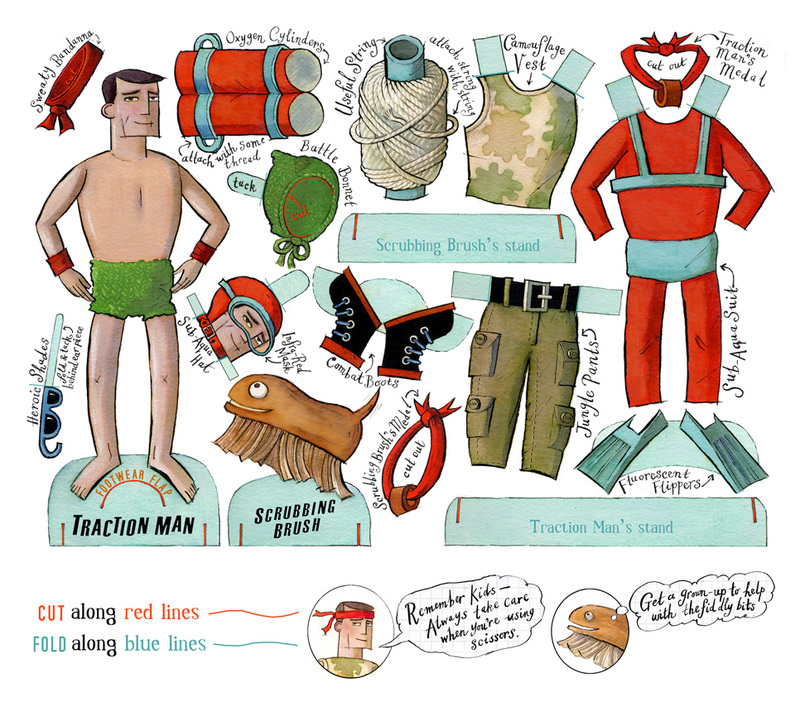 Like Mac Barnett, Mini Grey seems to traverse the gender specifics of childhood effortlessly, creating a story that acknowledges and values each part while creating a new whole. Mini Grey's action filled, comic book style panel illustrations with word bubbles (well, word rectangles, really) create suspense and movement in her books that readers will respond to. 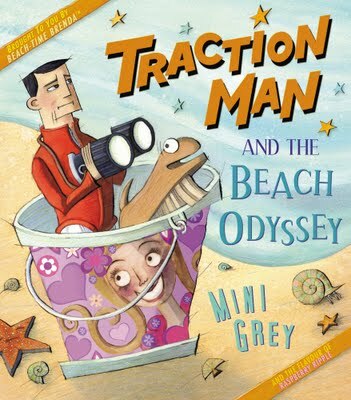 As I write this review, I have all three of the Traction Man books on my desk and it is intriguing to see the subtle changes in Grey's artwork over the course of the series (I hope it's a series - PLEASE WRITE MORE TRACTION MAN BOOKS, MINI GREY!!) Everything that is wonderful about Traction Man is Here is multiplied by the time, seven years later, Traction Man and the Beach Odyssey hits the shelves. The intricate, detailed illustrations, the exciting locales and the new cast of characters all accentuate Grey's skill as a writer and artist. 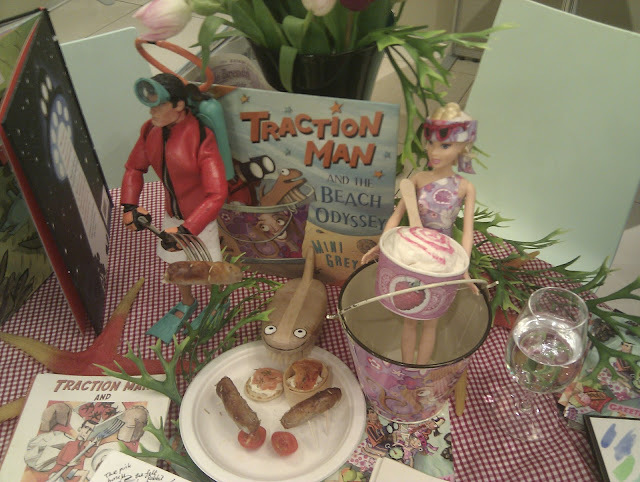 Just take a look at the front papers from Traction Man and the Beach Odyssey, above. The endpapers are similar, but feature a comic strip titled, "Beach-Time Brenda in It Came From the Sea," which finds Traction Man emerging from the ocean exclaiming, "Great Scott! I seem to have been washed up in the wrong comic strip! 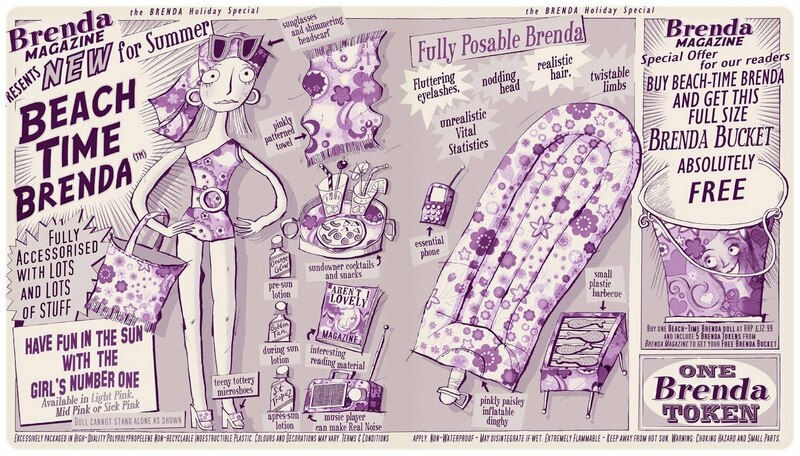 "while Brenda holds a tray of "snacks and sundowner cocktails." Do I even need to mention how fun these books are from an adult perspective?? For an old but excellent interview with Grey, visit Seven Impossible Things. But really, just go buy all of the Traction Man books! Biscuit Bear is a really great book, too. We LOVE Traction Man at our house. Her attention to detail is both amazing and hilarious. 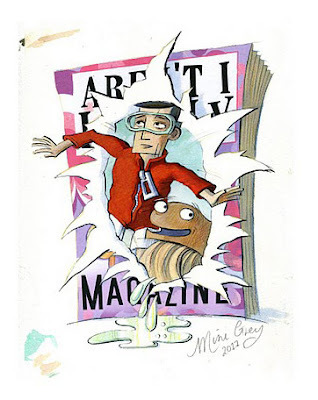 I have found myself showing some of the illustrations to my spouse (like Dad's magazines). I can't wait to get my hands on the new one! YES!! I was sooooo thrilled when I saw she had done another TM book. I hope she keeps going. 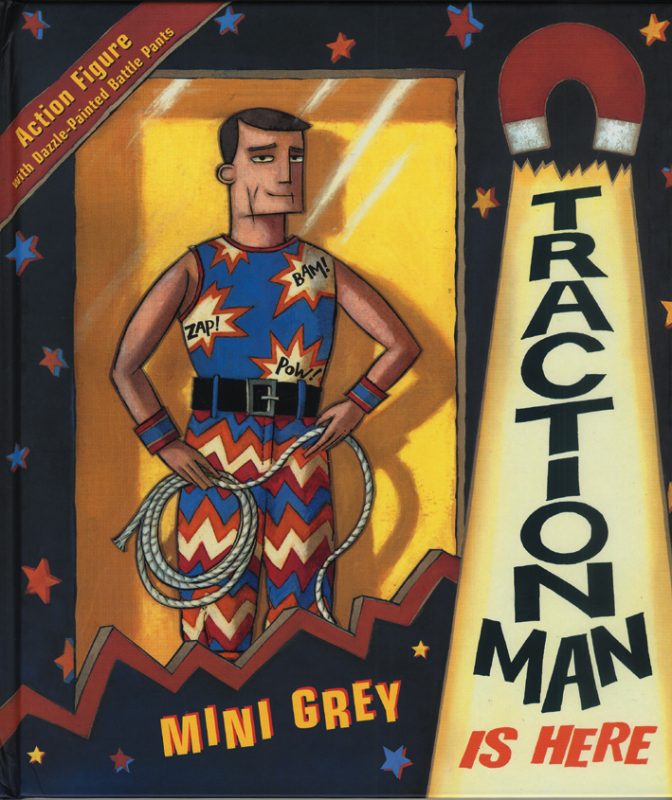 Unlike so many other picture books that become a series, Mini Grey and Traction Man just keep getting better and better.